40% more reach; zero compromises. Increase the reach of compatible AF-S NIKKOR lenses like the AF-S NIKKOR 400mm f/2.8E FL ED VR or the AF-S NIKKOR 70-200mm f/2.8G ED VR without sacrificing image quality, autofocus accuracy, metering or even VR image stabilization. Optimized for sports, action, wildlife and press photographers, the AF-S Teleconverter TC-14E III achieves superb 1.4x enlargement with only a 1-stop loss of light. Fluorine coatings protect the front and rear surfaces, and a durable lens barrel with water-drop resistance ensures the AF-S Teleconverter TC-14E III can hold up to professional use. Maximize the performance and reach of your NIKKOR lens. 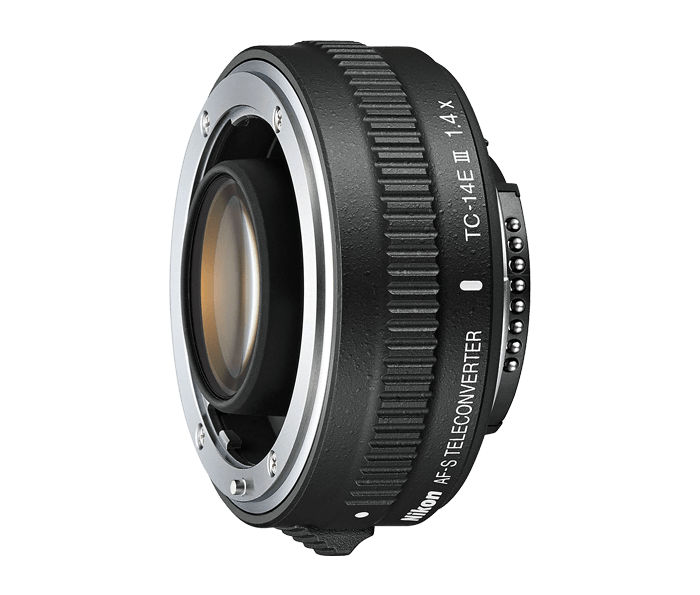 The AF-S Teleconverter TC-14E III increases the reach of compatible AF-S lenses by 40% with only a 1-stop loss of light. Turn the AF-S NIKKOR 70–200mm f/2.8G ED VR into a 98–280mm f/4 lens or the AF-S NIKKOR 400mm f/2.8E FL ED VR into a 560mm f/4 lens. Enjoy the speed, performance and lightness of smaller telephoto lenses with the reach of a super-telephoto lens. The AF-S Teleconverter TC-14E III features an optical design that draws peak performance from compatible AF-S NIKKOR lenses, including fast primes and zoom lenses. Enjoy stunning depiction—nearly the same image quality that a lens alone produces—outstanding autofocus accuracy, full metering performance and even VR image stabilization. If you shoot sports, action or wildlife, you know landing great shots sometimes means getting dirty. The AF-S Teleconverter TC-14E III is designed to be as rugged as the lenses it modifies. Fluorine coatings on the front and rear surfaces repel dirt and water droplets for clear views and easy removal, and the durable lens barrel also provides dust- and water-droplet resistance.